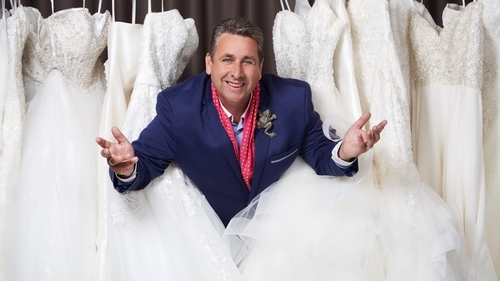 Ireland's most famous wedding planner Peter Kelly a.k.a. Franc presents the first Irish version of international reality hit series Say Yes to the Dress. The ten part series was filmed in a new couture section of Vows bridal store based in Blarney Business Park in Cork, stocked with stunning dresses from all over the world. Cameras will follow brides through the bridal salon as they try on all the styles, colours and patterns to then face their families and friends in the hope that they will Say Yes to the Dress. Hundreds of brides-to-be applied to take part and over 40 have been selected to feature in the series as they hunt for the perfect combination of lace, silk, taffeta, beading, sparkles, trains, tiaras and veils. The format is an Irish spin off from the hugely popular American series. The original show follows the team at Kleinfeld Bridal, the Manhattan-based bridal salon as the team bend over backwards to make each bride's experience unforgettable. Part bridal story, part fashion makeover and part family therapy session, each Say Yes to the Dress episode looks at the personalities and craftsmanship that come into play as the Kleinfeld staff goes to extreme lengths to realize each bride's dreams. Over 250 episodes (15 seasons) have aired on TLC in the States. The series has had spin offs in Atlanta, Canada, the UK and Australia to date.